Napa Valley Wine Library Association. Today, I represented TWWIAGE at the 56th annual Napa Valley Wine Library Association (NVWLA) tasting. 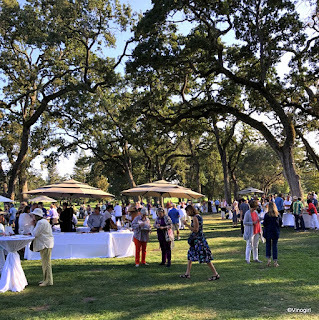 Held in the Grove at Silverado Resort & Spa, this years theme was 'Designated Vineyard Wines of Napa Valley.' It was a fun afternoon. 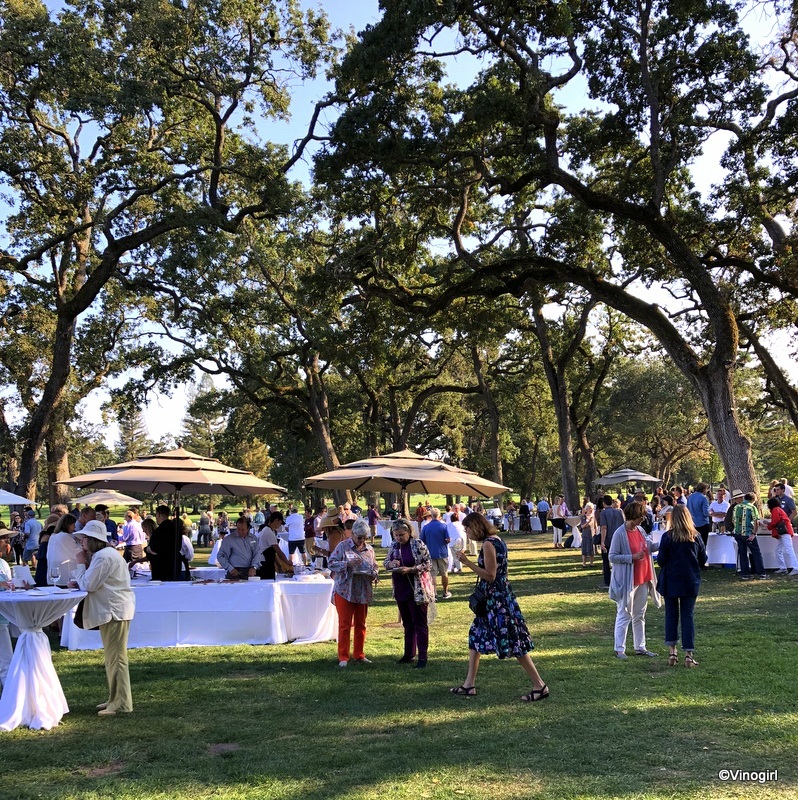 A well attended event, approximately seventy wineries were gathered together in the Grove pouring wines from specific vineyards throughout all of Napa's 16 American Viticultural Areas. I had managed to procure a guest ticket for Vinomaker and, although I was the only one who was technically working, it was his job to bring me any interesting wines he thought I might like. Which he did. Good man! 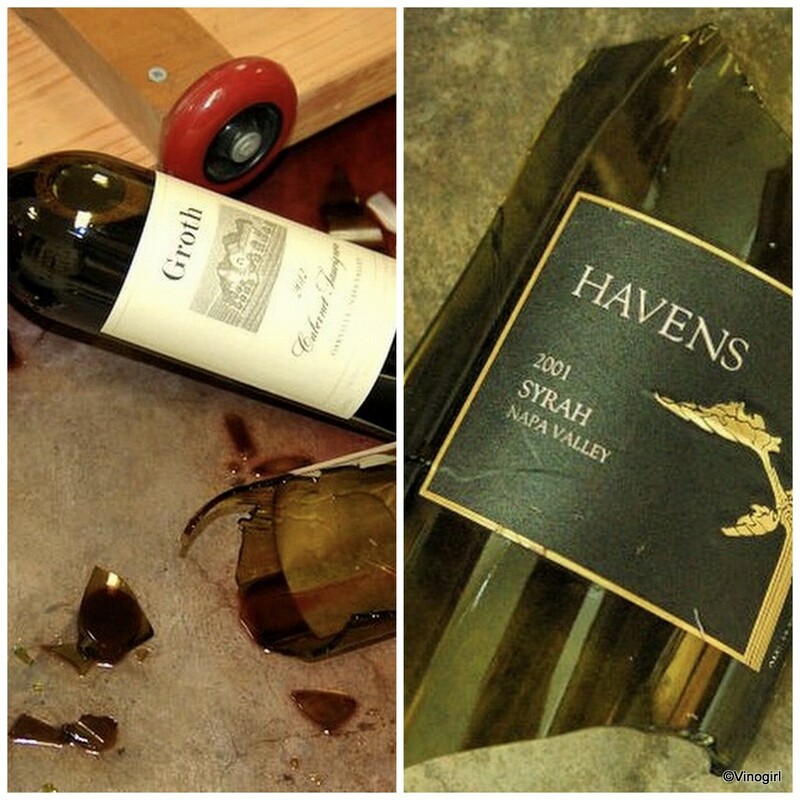 Today marks the 4th anniversary of the 6.0 earthquake that shook the Napa Valley to its core. I'm still mourning the loss of the magnum of Havens, 2001 Syrah that I had been saving for a special dinner with friends. I know Vinoland was lucky to get away with very little damage, just three bottles of wine in total broke, but still I find myself almost shedding a tear over spilt wine. Sigh. Square peg in a Walmart hole. You say clothespins, I say clothes pegs, but I have no idea what they call the wooden things one uses to fasten laundry to a washing line on Mars. Although I should because, apparently, I am now a Walmartian (that is, according to Vinomaker). Sheesh! I started to install the bird netting on the Pinot Grigio vines this past Sunday. Halfway through this particularly tedious job, I noticed that I was getting low on the amount of clothes pegs I had left and guesstimated that I wouldn't be able to finish that day. It wasn't until today that I had a chance to got out and buy more pegs. But could I find any? No. And that's how I ended up at Walmart. Double sheesh. 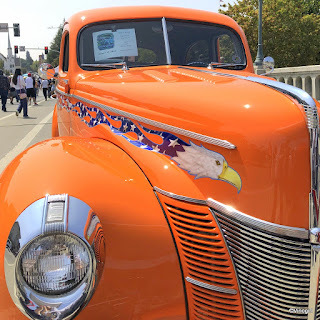 I may have mentioned this before, so forgive me, but the annual Main Street Reunion (MSR) classic car show, held downtown in the city of Napa, is one of my very favourite yearly events to attend. Or, should I say, it was. The MSR is now a shadow of its former self. The event was greatly diminished last year: this year I felt like I was watching the event in its death throes. This year, I'd guesstimate that there were only about 50% of the number of cars that used to exhibit. 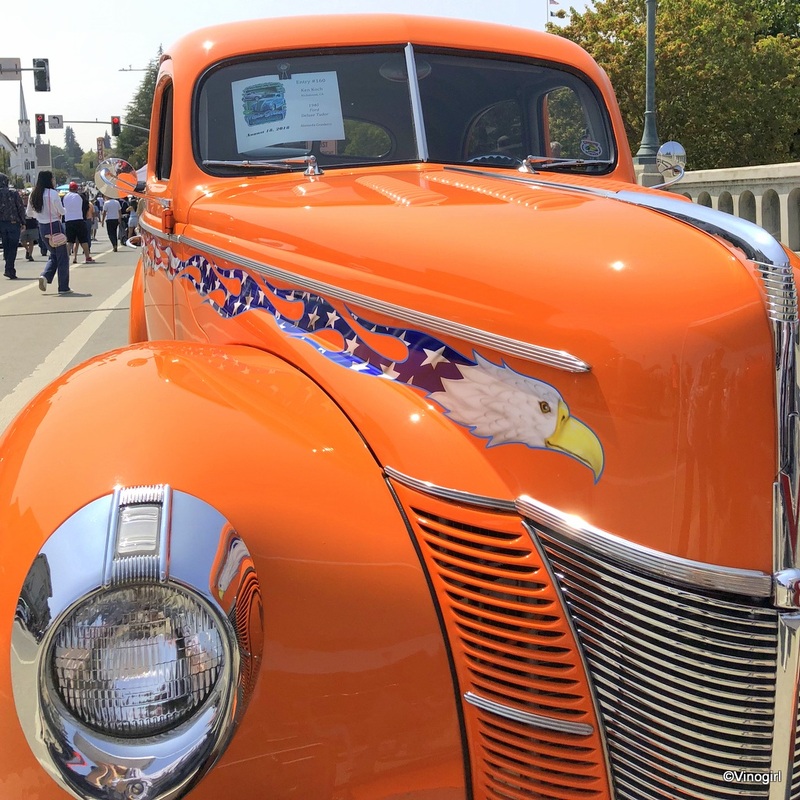 The cars in attendance were all spectacular, but I missed some of the cars that had over the years become familiar entrants. There was no draft beer for sale (Vinomaker will not drink out of cans) and there was no food items (well, kettle corn if you can call that food) available to purchase. Grapevines aren't the only things growing in Vinoland's vineyard. Besides vines and weeds, a volunteer tomato (toe-mar-tow) vine has decided to grow right next to a Syrah vine. The location, chosen no doubt so that the tomato can avail itself of the vineyard's irrigation system, poses a bit of a problem for me. Being so anthropomorphic, I am sure the tomato will suffer if I leave it in the vineyard. However, if I transplant it into the vegetable patch, being so late in the season, it'll probably never bear any ripe tomatoes. Or I could just yank it out and put it in the compost bin. Slow day. In today's news, Vinoland's table grapes are also going through veraison. The Red Globe grapes are enthused. It just occurred to me that I have never posted a photograph of the Orange Muscat vines doing their veraison-thing. Well, there's a good reason for that. Veraison in white grapes is just not as dramatic as veraison in black grapes. Grapes going from green to purple, versus grapes going from green to slightly less green, is way more paparazzi-worthy. Veraison, read all about it on Vinsanity. A little further along than I thought, the Cabernet Sauvignon (CS) vines are busy going through veraison. A little bit of hens and chicks, but otherwise the crop looks good. I've been preoccupied with the Syrah and the Pinot Grigio and hadn't really given the CS vines a thought. That's all about to change, tomorrow the CS will have my undivided attention. Well, that is until I have to put the bird-netting on the Pinot Grigio. I don't think so. This praying mantis may look harmless and angelic, but Stagmomantis californica is more adept at preying than praying. Happy hanging about amongst my courgettes, this miss, or mister, looks more like a mischievous green devil than a cheery cherub. One of the most successful hunters in the animal kingdom, mantises will eat just about any insect they come across - including other mantises. However, being so indiscriminate about what they snack on means that they will also prey upon other insects beneficial to a vineyard. Oops! This is the second mantis, in less than a week, to pop up out of nowhere and commune with me as I go about my business. However, it didn't have much to say for itself, its mouth was full. But that's alright, I'm just happy that Vinoland has such a diverse ecosystem. Hopefully, this mantis will cooperate and help me keep a happy balance in the vineyard. The wonderful view that usually greets me and Vinodog 2 when we reach the top of the hill behind Vinoland on our daily walk doesn't exist right now. Well, the view is there, but at present it isn't visible due to the amount of smoke that is in the air. My Mayacamas Mountains vista is in hiding, I can barely see it at all. Also the overall light quality is very odd making everything yellow and muted. However, I'm thinking a photographer would probably see some benefit to the perpetual golden hour the Napa Valley is experiencing. There are two major wildfires burning in Northern California right now. The Mendocino Complex Fire is now the largest wildfire in California history (recorded history, that is), it has currently burned over 300,000 acres and is still not contained. The Carr Fire in Shasta County, at present the 6th largest fire in California history, at approximately 180,000 is a mere tiddler in comparison. And all the resulting smoke is drifting south to wine country. I'm not really worried about smoke taint in the grapevines, but the possible reduction in light- and temperature-dependent photosynthesis is a little bit of a concern. When it is this smoky, and it has been for the past 10 days, or more, the chlorophyll in the vines cannot absorb enough sunlight to synthesis the sun's energy into carbohydrates. Bit of a problem when Vinomaker needs those carbohydrates (think sugar) to synthesise into alcohol. It has already been a cool growing season, so lack of good quality sunlight now is an ongoing concern of mine. Of course, my first thought is for the safety of anyone, or any animal, in the path of the many conflagrations burning around the entire state. Godspeed firefighters. Ta-da! Just like magic, veraison has also begun in the Pinot Grigio vines. Generally, the crop looks good this year except for a little millerandage which is no doubt due to the cool, windy weather we experienced all spring long. And especially when the grapevines were flowering. The under-developed berries shouldn't be a problem in the resulting Pinot Grigio wine, but they could be an issue, giving undesirable green-flavours, in the Syrah and the Cabernet Sauvignon. It's all good: this is the stuff that goes into making one vintage very different from another. Or at least the grapes are, veraison is upon Vinoland once more. It is very early in the process, but veraison has to start somewhere and that somewhere is usually in the Syrah vines (this year is no different). I will be checking in the Pinot Grigio tomorrow for signs of veraison there. I love the cyclical nature of farming grapes and the influence Mother Nature exerts over the whole affair. Veraison 2018 is about a week behind last year which doesn't surprise me one bit. After all, it has been a cooler than normal growing season.